A simple yet powerful writing programme: the Pen Pal Project. How do you feel when you ask your students to do a writing assignment? For me, it's less than pleasant. Even with the "better" classes, I have to flex my teacher muscles just to get my students to hand in their work &, most of the time, I get half-hearted work which is hastily done, short &, after reading a few of them, repetitive. I spent my early teaching years pondering & experimenting to pique my students' interest in writing & motivate them to write more. I started by asking what would motivate ME to write? With these 3 factors, I experimented with all sorts of programmes like getting my students to make their own big books because we didn't have big books at that time, getting students to tell stories to other students, & show & tell. None worked as well as the Pen Pal Project which I started experimenting with since 2010 & recently found out that I've only blogged about it once in 2011. What is the Pen Pal Project? Connecting a group of students from my school with another group of students from another school somewhere in Malaysia & exchanging letters once a month. 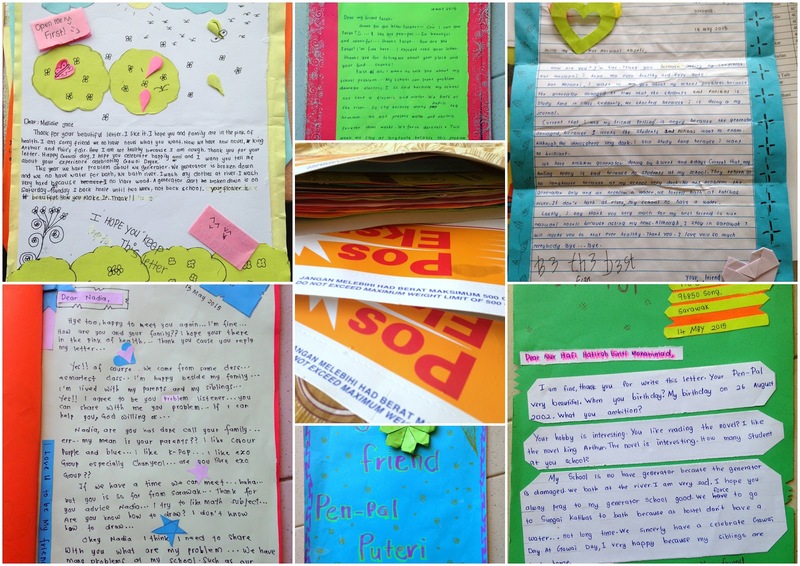 Over the years, my students have exchanged letters with students from all over Malaysia! What is the Outcome of the Programme? If you've never seen a student light up at a writing assignment, you've got to try this one. This is when many of my students first discover that they can write for school AND enjoy it at the same time. Also, over time I've had students surprise me with beautifully decorated letters & also letters which are longer & more elaborate than I'd usually get from a regular assignment. Which is why this is one of my staple programmes run every year. Not convinced? Read the following feedback from teachers I've collaborated with. Siti Hajar wrote, "My kids are more interested in writing tasks than they were before. They always found formal writing boring and most difficult. But after the pen pal programme, all they want every time is writing a letter! Looks like they did form a meaningful friendship with their pals!" Jia Yiing wrote, "It's not a norm to have students eager to write essays, but this programme proved otherwise. Students find them authentic & meaningful as what they wrote are not merely for exam purposes, but appreciated by their new friends." I've had many years to fine tune this programme & increase its effectiveness. I build interest early on. I pitch the idea to my students & ask what they think. I know their aspirations & make the programme relevant to them. I must convince them that it will truly benefit them. Perhaps they want to get to know people from a different culture? Perhaps they want to learn to express themselves better? Perhaps they want to help students from a remote part of the country improve their English? Perhaps they're willing to give it a try? Perhaps a rival class is taking part & they want to keep up? If they do not see a reason to do this, you'll face a lot of difficulty collecting letters & ensuring quality work later on. #2 Make it VOLUNTARY. But, force it on shy students. When I first started doing this, I made it compulsory for ALL the students in my classes to take part. I've had mixed results & I've found that some students really do not have the proficiency to be able to write a meaningful letter yet. So, I worked on my pitch & managed to convince most students to take part, targeting those in the medium-low proficiency range. I would only force students with good proficiency who are too shy to raise their hands. They usually hand in the best letters because writing is a comfortable means of communication for them. Also, allowing students to opt-in gives them some ownership of the programme & allows you to push them harder later (see #5). #3 Use social media to invite collaborators. I've always been able to easily & quickly find collaborators from a simple public Facebook status. In the future, I'll only open this programme up to the Jungle Teacher Community because of some bad experiences. I'm looking for teachers who demonstrate a higher level of interest & commitment. Once I have collaborators, I share my name list & tell them to pair the students up with the same gender as best as they can. This year, I'm running the programme for my Forms 1-4 students. 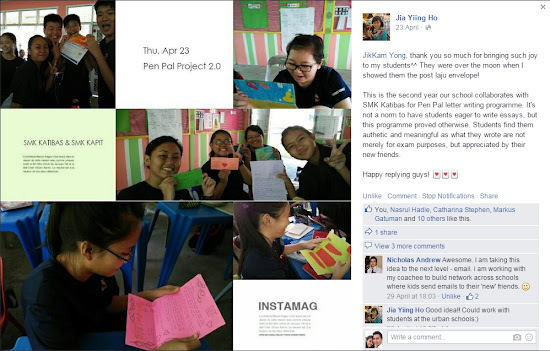 Each form has got roughly 30+ participants exchanging letters with different schools from Sabah to Penang. #4 Come up with some ground rules. - Only communicate via letters. - Letters must be handwritten. - At least 1 exchange every month. - No asking for phone numbers, Facebook, email, twitter, etc. #5 Check students' work. PUSH them to give their best. I always have my students hand in their letters 2 days before I intend to post. This is because I want to read everything they've written. I check for quality & make sure that every student is giving their best based on their level of proficiency. I reject letters which are too short & usually detain students who are late until they finish their letters to the best of their abilities. I remind them that this programme is more than just an exchange of letters. It's meant to improve their English at the same time. #6 Post using the school's allocation for postage. Every school has a generous allocation for postage. My school has a cabinet full of Pos Express envelopes which have been sitting there for YEARS. I wrote a proposal to the principal, got his approval & made use of those envelopes for the programme at no cost to myself or my students. Let me know in the comments if you want a copy of the proposal to be shared here in this blog post. If you think writing a proposal is more trouble than spending your own money, perhaps your clerk will give you the envelopes just like that. You never know until you ask. #7 (Optional) You might want to give your students a certificate at the end. I'd encourage them to write a reply anyway. Starting with jokes like ask their pen pals why they didn't reply & write that they were heartbroken & cried every night. Then, I'd get serious & remind them why they are part of this programme: to improve their English. It doesn't matter what they received. It matters what they produce because at the end of the day, the better they write, the better they become regardless of what their pen pal has given them. If they are of a higher standard than their pen pals, they should never lower their standards. They should strive for a higher standard. At the end of the programme, I want them to be able to say that they've improved themselves through this programme. Then, I'd contact my collaborator & ask what's up. I'd ask them to make things better & they usually do. When someone has taken the time & effort to make a letter especially for you with their own hands, you appreciate it so much more. It's a piece of bespoke art to be cherished. I also want my students to value things done slowly & enjoy the intense pleasure of anticipation. Can you get that with email? What about exchanging letters overseas? I want to have the letters exchanged cheaply & quickly. In order for some kind of meaningful outcome, there has to at least be an exchange every month. I'm not sure if that is possible with an overseas collaborator as posting could take weeks. Also, the postage cost will be enormous. For my students, having letters from another part of Malaysia is already a novelty.